Patients with diabetes have poor outcomes compared to the general patient population when undergoing percutaneous coronary intervention. The Cre8TM (Alvimedica) drug-eluting stent (DES) has unique features that may improve clinical outcomes in patients with diabetes. 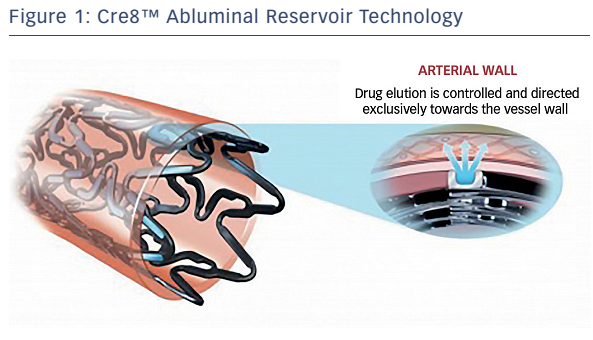 These include abluminal reservoir technology, a proprietary polymer-free drug-release system consisting of reservoirs on the stent’s outer surface that control and direct drug release exclusively towards the vessel wall, and the AmphilimusTM formulation, which enables enhanced drug tissue permeation, utilising fatty acid transport pathways. This is particularly advantageous in diabetic patients, since increased uptake of fatty acid occurs in diabetic cells. Furthermore, mTOR inhibitors (-limus drugs), which are utilised in DESs, are relatively ineffective in diabetic cells. Clinical efficacy and safety of the Cre8TM in patients with diabetes has been demonstrated in a number of clinical trials and real-world studies, and further studies are on-going. The authors have no relevant disclosures to make. The authors are grateful to the technical editing support provided by Katrina Mountfort of Medical Media Communications (Scientific) Ltd, which was funded by Alvimedica. Diabetes has reached epidemic proportions worldwide and its prevalence is rising. In 2015, 415 million adults had diabetes; nearly half (46.5%) of these remain undiagnosed.5 By 2040 this number is projected to rise to 642 million,5 representing a major health and economic burden. There is an urgent need to enhance procedural success and long-term clinical outcomes in the coronary revascularisation of patients with diabetes. In particular, there is a need for improved stent technology tailored to the needs of the diabetic population. This article describes the Cre8™ DES, which has a novel design that may provide particular efficacy and safety advantages in patients with diabetes. A second design characteristic unique to the Cre8™ is the Amphilimus™ formulation of the active antirestenotic drug. In this proprietary technology, sirolimus and a fatty acid are eluted together, allowing sustained drug elution, modulated drug bioavailability, a more homogeneous drug distribution and enhanced drug stability. Also important is the bioinducer surface, an integral ultra-thin (<0.3 μm) pure carbon coating that is covalently bonded to the thin CoCr platform (total thickness 70–80 μm). This is hypothesised to passivate stent–platelet interactions (since the bulk of the CoCr platform is sealed by the coating) and reduce the risk of thrombotic events. Other features of the Cre8™ include homogeneous stent design in lengths from 8 to 46 mm, excellent longitudinal stability on expansion, and two platinum markers at the stent ends. These data highlight the potential unmet need with regard to currentgeneration DES technology in patients with diabetes. Increasing total drug delivery to the vessel wall is one approach. This may be achieved by incorporation of an increased drug–polymer load, although this is likely to negatively impact overall vessel wall healing. Another possibility would be to use the same coating thickness with an increased drug:polymer ratio, but this would negatively affect the drug-release kinetics and make the polymer brittle. Placing the drug directly onto the bare metal would also be problematic in terms of control of drug release. An optimum approach might be to use standard drug–polymer loads combined with a formulation targeted to enhance uptake of drug at the cellular level. The next step in the Cre8™ clinical development programme was the retrospective MultIceNtric and RetrospectiVe REgiStry in 'real world' paTients with polymer-free drug elutInG stent Cre8™ (INVESTIG8) study. The primary endpoint was the incidence of a clinical composite endpoint (cardiac death/target vessel MI/clinically-driven TLR) at 12 months from the index procedure.25,26 Secondary endpoints comprised the incidence of a clinical composite endpoint (all deaths/all MI/any revascularisation) from the time of the index procedure to 12 months; and the incidence of stent thrombosis from the index procedure to 12 months, classified according to the Bleeding Academic Research Consortium definition (see http://bit.ly/2eemnyq). Twelve-month followup data were available for 589 out of the 647 patients enrolled (91 %). Of these, 47.4 % had diabetes. Chronic total occlusions were present in 3.4 %, ostial lesions in 15.5 %, bifurcation in 17.8 % and de novo lesions in 93.8 % of participants. The composite endpoint occurred in 4.2 % of patients, and clinically-indicated target vessel revascularisation in 1.5 %. In a sub-analysis of non-diabetic versus diabetic patients, only the composite endpoint was higher in patients with diabetes (5.0 versus 3.5 %; p=0.4863), and this was due to the expected higher incidence of cardiac death and MI. 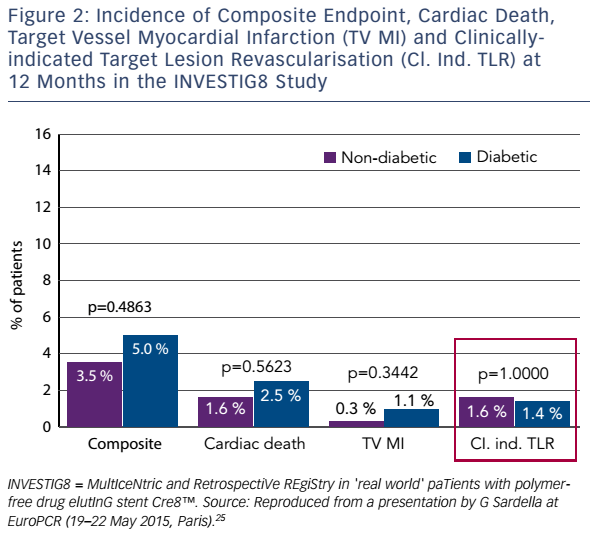 However, the incidence of clinically-indicated TLR was not higher in the subgroup with diabetes (1.6 versus 1.4 %; p=1.000; see Figure 2). 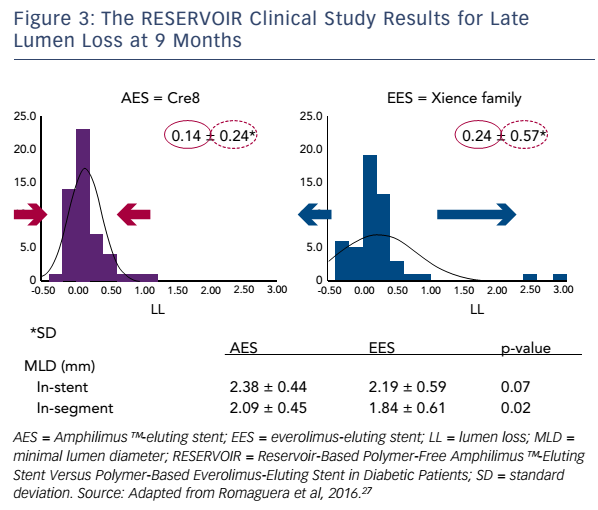 The Randomized Comparison of Reservoir-Based Polymer-Free Amphilimus™-Eluting Stent Versus Polymer-Based Everolimus-Eluting Stent in Diabetic Patients (RESERVOIR) clinical trial enrolled only patients with diabetes receiving glucose-lowering agents.27 The 112 participants were randomised either to Cre8™ or an EES (XIENCE®, Abbott Vascular). The primary endpoint – mean neointimal hyperplasia volume obstruction – was 11.97 ± 5.94 % in the Cre8™ group and 16.11 ± 18.18 % in the EES group (noninferiority p=0.0003; superiority p=0.22). Prespecified subgroup analysis showed consistent treatment effect in favour of the Cre8™ arm across all subgroups. In terms of secondary endpoints, LLL in the Cre8™ arm was 0.14 ± 0.24 mm compared with 0.24 ± 0.57 mm in the EES arm. The difference between the standard deviations is striking, and demonstrates the consistent performance of the Cre8™ (see Figure 3). The minimal lumen diameter was also higher in the Cre8™, both in-stent (2.38 ± 0.44 mm versus 2.19 ± 0.59 mm; p=0.07) and in segment (2.09 ± 0.59 mm versus 1.84 ± 0.61 mm; p=0.02). While a growing body of clinical and real-world data has provided support for the efficacy of the Cre8™, studies have been underpowered to demonstrate statistical superiority over other DESs. To do so, a large clinical study is planned: the Clinical benefit in ‘all comers’ patients with DIABetes to prove Cre8™ DES superior efficacy (DIAB8).29 In this study, all-comer patients with diabetes undergoing PCI will be randomised in a 1:1 ratio to the Cre8™ or to an everolimus DES. The primary endpoint will be 12-month target lesion failure. Around 2,200 patients from 50 international sites will be recruited and clinical follow-up will be at 1 and 3 years. In addition to these efficacy data, the Cre8™ has demonstrated excellent safety. In the INVESTIG8 study, the incidence of definite stent thrombosis at 12 months was low in both non-diabetic and diabetic patients (0.3 % in each group). The ranDomizEd coMparisOn betweeN novel Cre8™ DES and BMS to assess neoinTimal coveRAge by OCT Evaluation (Demonstr8) study was designed to assess whether strut coverage 3 months after implantation of the Cre8™, once it becomes a BMS after complete drug-elution, was equivalent to a standard BMS.30 Patients (n=38) with ischaemic myocardial symptoms related to de novo lesions in native coronary arteries were randomised 1:1 to receive a Cre8™ or a BMS (VISION®, Abbott Vascular). The primary endpoint of ratio of uncovered to total stent struts per cross section (RUTTS) score <30% occurred in 99.8% of Cre8™ struts and in 99.6% of the BMS struts (p for noninferiority <0.001). The first results of a single centre registry study undertaken in Utrecht (U-Cre8) have recently been presented.31 This study involved 332 coronary lesions in 201 patients with diabetes and accrued data from 2012 to 2014. A retrospective analysis propensity-matched 99 patients receiving the Cre8™ with 102 patients receiving a zotarolimus-eluting stent (ZES). The mean duration of dual antiplatelet therapy following PCI was 4.8 ± 3.4 months in the Cre8™ group versus 5.9 ± 4.1 in the ZES group. Target-lesion failure occurred in six (6.1 %) patients in the Cre8™ group compared to 11 (10.7 %) in the ZES group. These failures were attributable to TLR in three Cre8™ patients (3.0 %) and seven ZES patients (6.9 %). End MACE-free survival was reported in 93 (93.9 %) Cre8™ patients compared to 87 (85.2 %) of the ZES group at study end. It must be stressed, however, that these are preliminary data that still require independent adjudication. The Prospective, Single Center, Open Label, Randomized Controlled, Two Arm Study Evaluating Safety and Efficacy of the Permanent Polymer Zotarolimus Eluting Stent Resolute Integrity Compared to the Polymer Free Amphilimus™-Eluting Stent Cre8™ (ReCre8) is currently recruiting participants. In this all-comer study, patients (n=1,530) with ischaemic myocardial symptoms are randomised to the Cre8™ or the Resolute DES (Medtronic).32 The study is also investigating the use of dual antiplatelet therapy for 1 month in elective PCI. Clinical follow-up is at 1, 2 and 3 years, and the primary endpoint is MACE at 12 months. Excellent safety and efficacy data have been reported in support of the Cre8™, and results of the ReCre8 study are awaited. Poorer outcomes following PCI reflect an unmet need in stent technology for patients with diabetes. The lower efficacy of DESs in these patients is largely due to reduced responsiveness of cells to -limus drugs. The Cre8™ utilises a proprietary polymer-free drugrelease system consisting of reservoirs on the stent’s outer surface, maximising drug delivery without increasing the dose. The Amphilimus™ formulation enhances cellular drug uptake, particularly in diabetic cells. Finally, clinical trial and real-world data have demonstrated the superior performance of the Cre8™ compared with other DESs in diabetic subgroups, as well as remarkable consistency in terms of LLL. These findings suggest that the Cre8™ is a useful option in PCI in this challenging patient population. Data from on-going studies are eagerly anticipated. Byrne RA, Serruys PW, Baumbach A, et al. Report of a European Society of Cardiology-European Association of Percutaneous Cardiovascular Interventions task force on the evaluation of coronary stents in Europe: executive summary. Eur Heart J 2015;36:2608–20. Lim JY, Deo SV, Kim WS, et al. Drug-eluting stents versus coronary artery bypass grafting in diabetic patients with multi-vessel disease: a meta-analysis. Heart Lung Circ 2014;23:717–25. Tu B, Rich B, Labos C, et al. Coronary revascularization in diabetic patients: a systematic review and Bayesian network meta-analysis. Ann Intern Med 2014;161 :724–32. Moretti C, Lolli V, Perona G, et al. 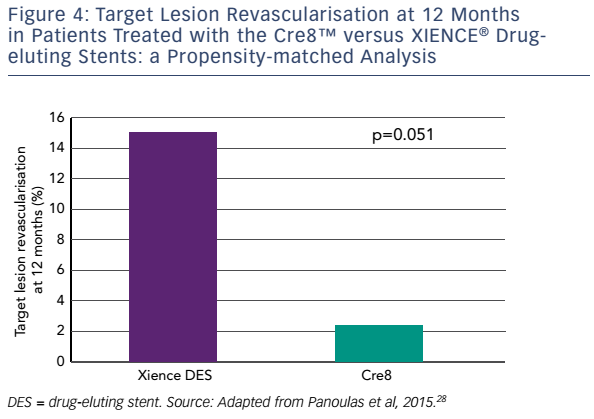 Cre8™ coronary stent: preclinical in vivo assessment of a new generation polymerfree DES with Amphilimus™ formulation. EuroIntervention 2012;7:1087–94. Mehilli J, Byrne RA, Wieczorek A, et al. ; Intracoronary Stenting and Angiographic Restenosis Investigators – Test Efficacy of Rapamycin-eluting Stents with Different Polymer Coating Strategies (ISAR-TEST-3). Randomized trial of three rapamycin-eluting stents with different coating strategies for the reduction of coronary restenosis. Eur Heart J 2008;29:1975–82. Byrne RA, Kufner S, Tiroch K, et al. ; ISAR-TEST-3 Investigators. Randomised trial of three rapamycin-eluting stents with different coating strategies for the reduction of coronary restenosis: 2-year follow-up results. Heart 2009;95:1489–94. Kim WJ, Lee SW, Park SW, et al. ; ESSENCE-DIABETES Study Investigators. Randomized comparison of everolimuseluting stent versus sirolimus-eluting stent implantation for de novo coronary artery disease in patients with diabetes mellitus (ESSENCE-DIABETES): results from the ESSENCE-DIABETES trial. Circulation 2011;124:886–92. Piatti P, Di Mario C, Monti LD, et al. Association of insulin resistance, hyperleptinemia, and impaired nitric oxide release with in-stent restenosis in patients undergoing coronary stenting. Circulation 2003;108:2074–81. Shoukry A, El-Sherbieny I, Swelan E. Association of insulin resistance, insulin and leptin levels with coronary in-stent restenosis. Egyptian Heart J 2012;64:35–42. Chabowski A, Gorski J, Glatz JF, et al. Protein-mediated fatty acid uptake in the heart. Curr Cardiol Rev 2008;4:12–21. Kim MJ, Doh HJ, Choi MK, et al. Skin permeation enhancement of diclofenac by fatty acids. Drug Deliv 2008;15:373–9. Carrie D, Berland J, Verheye S, et al. A multicenter randomized trial comparing amphilimus- with paclitaxel-eluting stents in de novo native coronary artery lesions. J Am Coll Cardiol 2012;59:1371–6. 22.Carrie D. Polymer-free Cre8TM DES: Design, current status and future directions. Presented at: TCT 2015 – Transcatherter Cardiovascular Therapeutics, San Francisco, CA, 11–15 October 2015. Park GM, Lee SW, Park SW, et al. Comparison of zotarolimuseluting stent versus sirolimus-eluting stent for de novo coronary artery disease in patients with diabetes mellitus from the ESSENCE-DIABETES II trial. Am J Cardiol 2013;112:1565–70. Grube E, Chevalier B, Guagliumi G, et al. The SPIRIT V diabetic study: a randomized clinical evaluation of the XIENCE V everolimus-eluting stent vs the TAXUS Liberte paclitaxeleluting stent in diabetic patients with de novo coronary artery lesions. Am Heart J 2012;163:867–75 e1. Mountfort K. Patient-tailored drug-eluting stent choice – a solution for patients with diabetes. 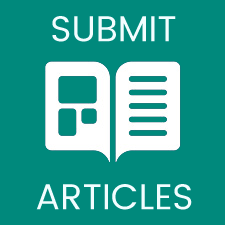 Interventional Cardiology Review 2015;10:158–61. Romaguera R, Gomez-Hospital JA, Gomez-Lara J, et al. A Randomized Comparison of Reservoir-Based Polymer-Free Amphilimus-Eluting Stents Versus Everolimus-Eluting Stents With Durable Polymer in Patients With Diabetes Mellitus: The RESERVOIR Clinical Trial. JACC Cardiovasc Interv 2016;9:42–50. Panoulas VF, Latib A, Naim C, et al. Clinical outcomes of real-world patients treated with an amphilimus polymerfree stent versus new generation everolimus-eluting stents. Catheter Cardiovasc Interv 2015;86:1168–76. Prati F, Romagnoli E, Valgimigli M, et al. Randomized comparison between 3-month Cre8 DES vs. 1-month Vision/Multilink8 BMS neointimal coverage assessed by OCT evaluation: the DEMONSTRATE study. Int J Cardiol 2014;176:904–9.